Papyrus codex containing Isaiah 47:1-66:24 in Coptic (Sahidic). 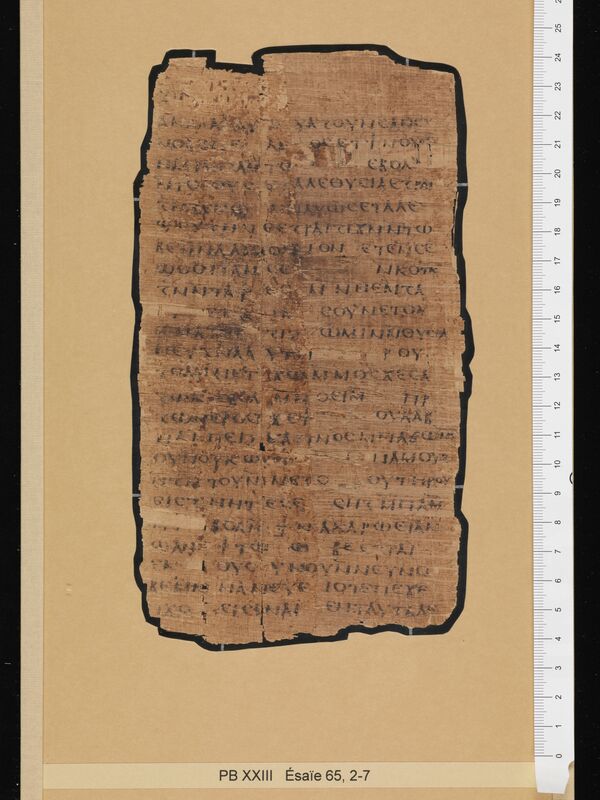 Description: P.Bodmer 23 is a papyrus codex containing Isaiah 47:1-66:24 in Sahidic. It is one of the few codices of the “Bodmer Papyri” that can be dated with confidence thanks to information gathered from the documents extracted from the front of its leather cover (economic information places the documents in the early fourth century; the cover must have been constructed at some point after that). The papyrus of the codex itself is of a poor quality forcing the scribe to skip over the imperfections in the papyrus while writing (page 33). The text is written in a remarkably pure Sahidic (Kasser, Papyrus Bodmer XXIIII, 23). CopistesOrsini classifies the hand as Biblical Majuscule and notes that the hand of this scribe tilts slightly to the right, at time exhibiting a slightly curved pattern (Orsini, “La Maioscula,” 131; “I papiri Bodmer, 77). Dimensions: The width of the page is 13.5 cm. The height of the page is 21.6 cm. The ratio of the page (width/height) is 0.625. The writing is in a single column. The width of the written area is about 10.0 cm. The height of the written area is about 16.5 cm. There are 24 lines per page There are 40 extant folia. Quires: The codex is made up of six quires. The first five quires are quaternions and the final quire is made up of a single sheet folded in two. Of the first five quires, all but the second are organized →↓,↓→, etc. The second quire, however, has the central sheet placed backwards. Cover: The two boards of the leather cover of P.Bodmer 23 survived. Fragments of waste papyrus were glued to the outer leaf of the first quire of the book block. This was followed by a guard page that contained only the title of the codex on the outer page. The back cover, however, is not glued directly to the last page of the final quire. 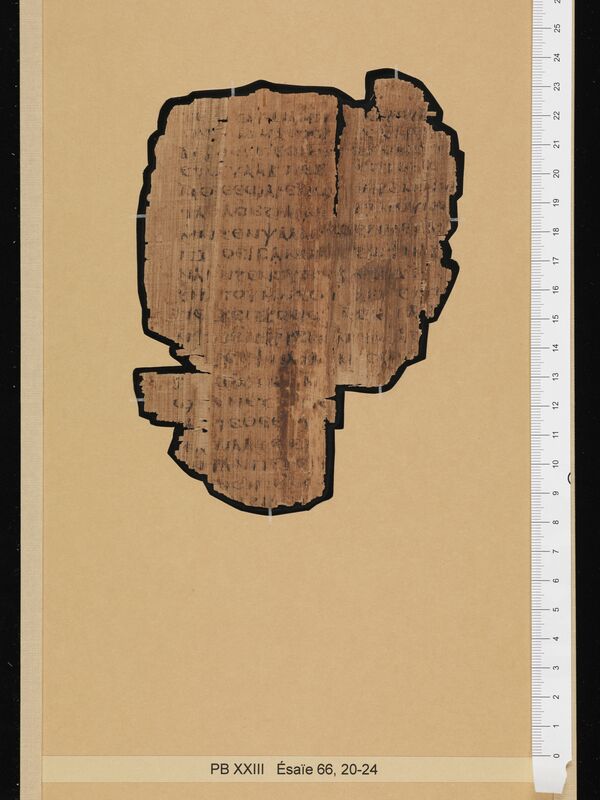 The waste papyrus boards were then covered with a sheet of leather (which also covers the first leaf of the first quire). 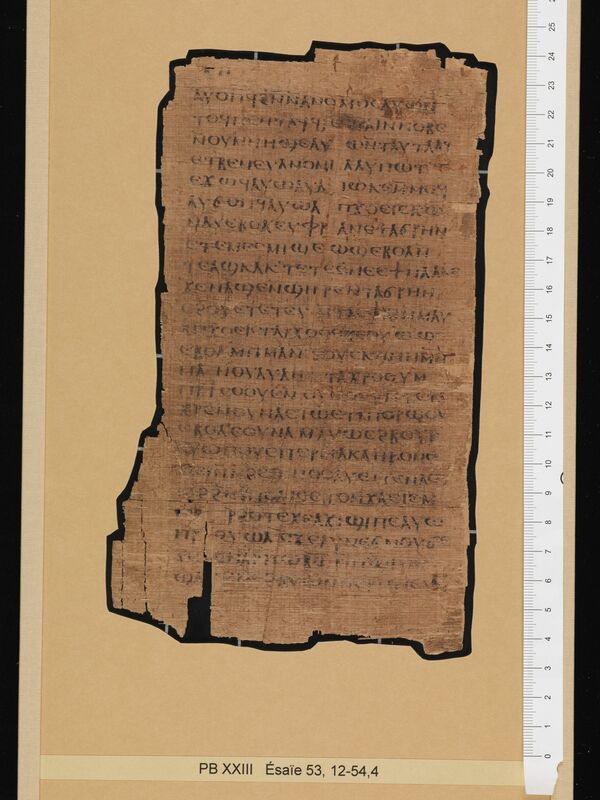 The leather was attached by folding it over the papyrus boards, gluing it and weaving three leather straps to hold the folds in place (for illustrations, see Kasser, Papyrus Bodmer XXIII, 10-11). In 1972, the upper board was sent to the British Museum and disassembled, and several inscribed papyri, both documentary and literary, were extracted from it (Di Bitonto Kasser, “P.Bodmer LI recto,” 112). These have been designated P.Bodmer 51, P.Bodmer 52, P.Bodmer 53, P.Bodmer 54, P.Bodmer 55, and P.Bodmer 56. Binding: The quires were bound using a link-stitch at two independent pairs of sewing stations. The quires were sewn with a fine thread about 1 mm in diameter. 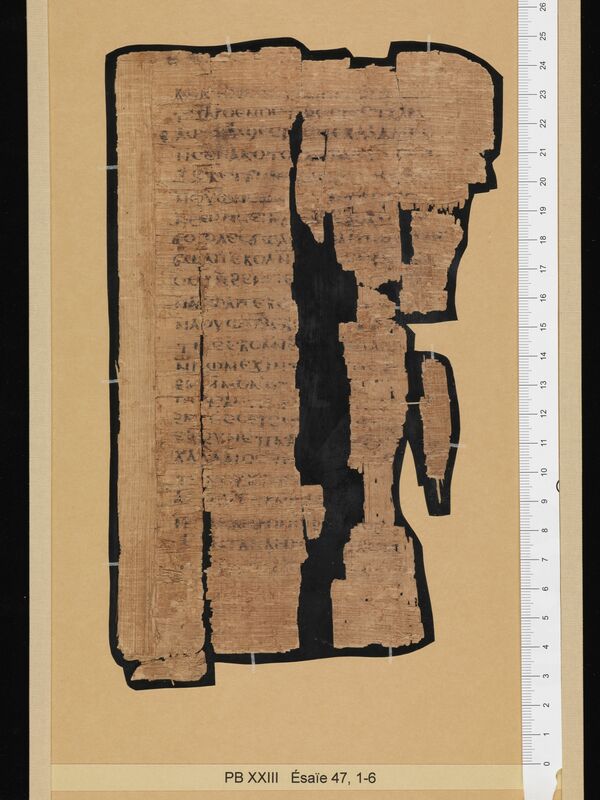 Kasser suggests that part of a thread found in the book may have been used for a bookmark (Kasser, Papyrus Bodmer XXIII, 15). The binding is reinforced in quires 1, 2, 5 and 6 by a strip of parchment inside the medial fold. All the quires are reinforced in the back with a parchment strip. Paratextual features: Small subdivisions are marked with a type of apostrophe, placed just above the preceding letter. On three occasions the scribe ends a page with a series of diples (page 7, page 44 and page 78). These may correspond to the ends of chapters 48, 58 and 66 respectively. Decorations: Between the end of the text of Isaiah and the end-title, there are several decorative forked paragraphoi and horizontal lines (page 80). RésuméPapyrus codex containing Isaiah 47:1-66:24 in Coptic (Sahidic). Kasser, Rodolphe. Papyrus Bodmer XXIII: Esaïe XLVII, l-LXVI, 24 en sahidique. Cologny-Geneva: Bibliotheca Bodmeriana, 1965. Di Bitonto Kasser. “P.Bodmer LI recto: esercizio di divisione sillabica.” Museum Helveticum 55 (1998): 112-118. Fournet, Jean-Luc. “Anatomie d’une bibliothèque de l’Antiquité tardive.” Adamantius 21 (2015): 8-40.